The Foundational Adjustment Layers Mastery Workshop on DVD is similar to attending my 2 days Adjustment Layers Mastery Seminar except that you don't need to travel and you can study the materials anywhere, as many times as you want. The goal of this new tutorial is to explain how I optimize my Fine Art Photographs through the use of Adjustment Layers in Photoshop. The goal is to create a final master file. A master file is a print-ready Tiff or Photoshop file from which I create my Fine Art Prints. The use of adjustment layers is at the foundation of the image quality that I look for. No other approach available today delivers a finer image quality. This tutorial is intended to complement (not replace) the Printing Mastery Workshop on DVD. I wanted to give you feedback for the Layers Mastery DVD. Most striking was the way your images came across through the videos. I was able to follow the optimization, look at them for a long time, and see the final glow of a masterfile. Subjects like black point, RUSM, and selective color took several videos for me to grasps. Because you do them several different ways and for several different reason it required 10-20 photos for me to fully understand their goal. I was glad you explained it with so much depth. I am most interested in your comments on selective color and color theory. I was glad you went into detail on the dvd. I was inspired to continue learning this topic. I was also able to dramatically improve the quality of my prints which is what I wanted to get out of the dvd. I did several before and after prints. The goal of this tutorial is to explain not only what I do but also why I do it. I previously released Alain's Master Files CDs 1, 2 and 3. These tutorials showed you what I did by providing you with the layered adjustment files that I use to create my Fine Art Prints. This new tutorial expands on the Master Files CDs 1, 2 and 3 by not only providing you with my master files but also by explaining exactly how I created each Master File. 1 - 30 tutorial movies about how and why I created each adjustment layers on 30 of my most recent Fine Art Photographs. That is correct, not 12, not 24 but 30 new and different Fine Art Photographs with all the adjustment layers used to create them. Each of these 30 Fine Art Photographs was created during this past year (2009). Therefore, they show my most current workflow. Also, none of these photographs were featured on my previous tutorials. Therefore if you own my other tutorials, you will not get the same information twice. 2 - The full coverage of my workflow from Raw Conversion, to layer-based image optimization, to soft proofing and finally to print-proofing using tutorial movies. 3 - A discussion about the importance of Image Adjustment as well as why this approach has been here far before digital photography was about. It was widely used in Chemical photography, the only thing that was different was that it was done in the darkroom instead of the computer. 4 - An explanation of why "Printing" has little to do with printers and much (if not most) to do with image optimization software. While in the darkroom the enlarger was the tool that created the fine art print, today Photoshop is the tool that creates our fine art master files! I go over the details of this important change in this tutorial. My presentations in this tutorial feature the technical means through which I prepare my final Adjustment Layer Files. However, this is not all that these presentations are about. 6 - In the 40 + tutorial movies featured on this Mastery DVD, I also talk about why I composed an image a certain way, and I show alternate compositions that did not make "the final cut" so to speak. These are compositions I considered, and that often I worked on as a master file, but decided not to feature in my portfolios when the time came to make final decisions. I also talk about artistic considerations, such as what I think about when I compose an image in the field and, later, when I select this image among the hundred, or thousand of images I bring back from a photography expedition. I also talk about why I make specific artistic decisions in regards to optimization in the studio and how these decisions are translated into technical processes aimed at recreating what I saw in the field. Layers are both one of the most important and one of the most difficult areas of Photoshop to learn and to master. Layers are important because layers offer a non-destructive and infinitely adjustable method for the creation of Fine Art Photographs. For example, do you know that there are 149 different commands in the Layers Palette? If this surprises you, you are not alone. I was shocked at this number when I got around to counting the actual number of commands! In the Layers Mastery Workshop on DVD I explain what each of these 149 commands does, as well as which ones are important and which ones are not. This is a complex subject, and my goal is to explain how to create beautiful photographs using what I consider to be one of the most powerful features of Photoshop, and one that all Master Fine Art Photographers use. I'm working my way through the DVD--just finished half of it--and had to tell you how delighted I am with it. I relate to your practical and aesthetic approach so completely! It's helped me with my understanding already, and your delightful accent is an added bonus. The illustration are great and a huge help. Thanks for this! There are no tutorials focusing solely on Fine Art, layer-based, image optimization. As a result, many photographers either use only a small part of what layers can do or do not work with layers at all. Among those who do work with layers, many get frustrated and stop using layers altogether. This is a very unfortunate situation. Why? First, because by not using layers, or by not using everything that layers can do for you, you only use a small part of what Photoshop has to offer. You see, Photoshop is essentially built around a layer-based workflow. So, if you do not use layers, you are not using Photoshop for what it was made to do. As a result, you spent hundreds of dollars for software capabilities that you are not using. The frustration that many photographers experience with layers has led many photographers to do all their image "optimization" in the raw converter. This is a huge mistake when it comes to creating Fine Art Photographs because as of today, no raw converter offers all the image-enhancement capabilities of Photoshop. Plus, no raw converter in the world offers a Layer-Based workflow. What this means is that if you do all your image optimization in a Raw converter (regardless of which exact converter you are using) you are not maximizing the possibilities offered by your image. In other words, you are not maximizing the color quality, the contrast quality, the detail level, the color range and much more that is in your photographs. A lot of what you captured in the field is not making it to the final image because it is not optimized properly and as a result it cannot be seen in your final photographs. Often, photographers also damage the image data during improper optimization in the raw converter. As a result, a lot of what their cameras capture is not seen in the final image. Here too, hundreds, if not thousands of dollars spent on purchasing a fine camera and lenses is lost because the image data was not processed properly and what the camera captured did not make it to the final version of the image. In the Adjustment Layers Mastery Workshop on DVD I show you exactly how to process your images in the raw converter so that no image data is lost during the conversion. I also show you how you can recover image data that you thought was lost. In the Adjustment Layers Mastery Workshop on DVD, I show you the exact workflow that I use in the raw converter prior to importing my images in Photoshop and completing the image optimization, soft proofing and print proofing process there. 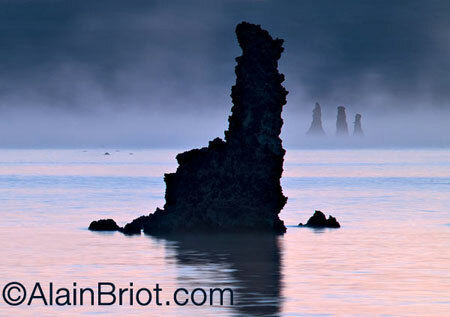 Image optimization is a requirement for the creation of a Fine Art Photograph. This is because the goal is to express an emotional response to the subject we photographed, and not just show the subject as the camera captured it. In this approach it is crucial to understand the differences between what the camera sees and what we see. We also have to know how to transform what the camera saw into what we saw. This is where image optimization comes in. The finest way of doing this is through layers, which is why I created this tutorial. The 30 Adjustment Layers Files are organized by geographical area. My goal was to feature a wide diversity of areas to show you how to optimize photographs that present widely different challenges, both from an artistic and a technical perspective. As with all Mastery Workshops on DVD, an update area will be available for the Adjustment Layers Mastery Workshop on DVD. The link to the updates page will be emailed to you when you order the DVD. You will also have the opportunity to ask questions and have the answer to your questions posted in the updates area. I am enjoying the new layers DVD very much . I think this is a fabulous product and the information is very valuable. For me, perhaps the most valuable part is the discussions of the master files. All Mastery Workshops on DVD come with a live seminar recording. The seminar I selected for the Adjustment Layers Mastery Workshop on DVD is the 2009 Zion Fine Art Summit. A separate audio CD featuring the Presentations I gave at the 2009 Zion Fine Art Summit will be included with the Adjustment Layers Mastery Workshop on DVD. 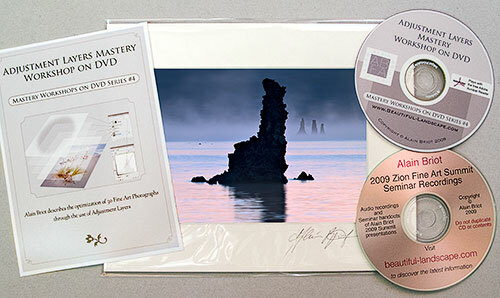 A matted and signed Fine Art Companion Print of Four Tufas, one of the 30 Fine Art Photographs featured on the DVD, is included in this tutorial package. This Fine Art print will allow you to compare the image quality on screen to that of he actual print. This is necessary because nothing is as beautiful as an actual Fine Art Print. Everything else is a reproduction. This collectible print will also be an addition to your Fine Art collection. The Adjustment Layers Mastery Workshop on DVD and the Zion Summit Presentations CD feature over 24 hours of audio and video recordings. This DVD also features 30 master files totaling hundreds of adjustment layers, 20 Photoshop composition and layer files for you to study, and over 40 PDF files that provide a summary of the teaching done in the video and audio files. The Adjustment Layers Mastery features the exact same knowledge as my 2-days Adjustment Layers Mastery Seminar. To be fair to Seminar Participants, the Adjustment Layers Mastery DVD is priced similarly to the Adjustment Layers Mastery Seminar. However, there are advantages to studying with the Adjustment Layers Mastery DVD. First, you do notneed to travel and therefore you save on travel expenses, lodging, car rental and other incidental expenses. Second, you can study the material at your own pace instead of having to absorb this immense amount of material in just two days. Third, you can study anywhere and anytime you like, instead of having to fit the seminar in your schedule. Finally, you can refer to the DVD later on, as often as you want, instead of referring to brief seminar notes, or trying to remember what was said. If sold separately, my Master Files, when sold separately, are priced at $75 each. 30 Master Files, the number featured on the DVD, would total $2250. The DVD is priced well below that. It is therefore is a unique opportunity to own a large collection of my Master Files at a very low price. to share your techniques is unmatched in this business. All my Mastery Workshops on DVD feature an owners update page on my site. The link to this page is emailed to you after you place your order. Updates are posted when new software is released or when changes are made to my workflow. You also are invited to ask questions related to the material on the DVD. Answers to your questions are posted in the DVD updates area. You can also read answers to questions sent by other DVD owners. Your Adjustment Layers Mastery Workshop on DVD package comes with a $100 off coupon good towards any of our workshops. This coupon carries no expiration date and can be used at any time. If you do not have a CD/DVD reader in your computer, we can ship the Personal Vision Mastery Workshop and the Summit Presentations on a USB Flash Card instead of on CD and DVD. If you want to take advantage of this option, simply place your order using the link above, then email us at alain@beautiful-landscape.com to let us know that you want your order delivered on a USB Flash Card rather than on CD and DVD. The cost is the same. We offer the option of paying for your Master Class in 3 equal installments instead of all at once. The three installments will be placed on your credit card a month apart. The first installment will be applied the day you place your order., the second one a month later and the third two months later. To take advantage of this option simply email alain@beautiful-landscape.com or call us with your credit card, phone number and shipping information. There is no extra cost for this option and your order will ship immediately. Still not sure if this Mastery Workshop on DVD is for you? about the Mastery Workshop on DVD series?